Mahesh thanked his fans for their continuous support and love that he has been receiving through out his career. The makers of SPYder organised a pre-release event for the Telugu version of the film in Hyderabad which was a special event for the fans. The event witnessed the entire cast and crew of SPYder attend and fans of the super star gathered in huge numbers making the event a huge success. SPYder, which will have Mahesh Babu playing the role of a stylish intelligence officer, is being released on September 27th, 2017 worldwide in Telugu and Tamil simultaneously. SPYder will also be Mahesh’s debut in Tamil since this is his first straight film in his career. “He gave me a one-and-a-half-hour narration at my house. 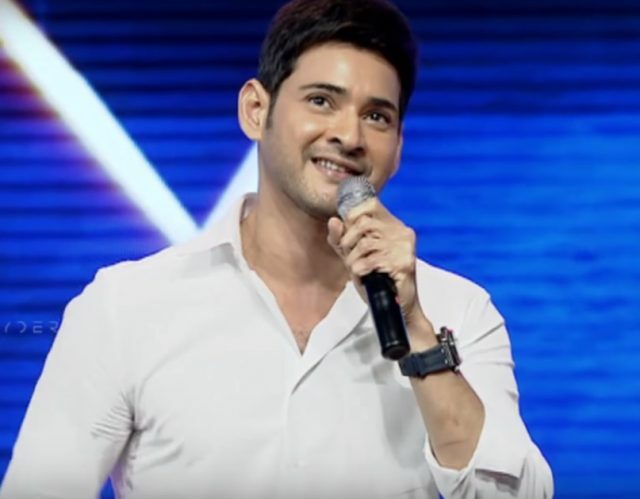 He said it will be an extra-ordinary thriller with some great visuals and brilliant action episodes which will stun the viewers,” Mahesh added further stating he was stunned himself when looked at the rushes. Mahesh also thanked his fans for being supportive all through his career and said te film will be a feast for them. “I don’t think any other hero would have this kind of admiration,” said Mahesh which sent his fans present at the venue into a frenzy. “You guys have watched my films only if you liked it, else they weren’t watched,” added Mahesh further.